DINGO GRAPPLE-RAKE #22521 : FRAME WIDTH 34" : MAX OPENING 31"
2) HYD. CYLINDERS PRODUCE 3000 LB OF CLAMPING FORCE ; TINES ARE 3/8"
Caution : close grapple before disconnecting hydraulic lines !! 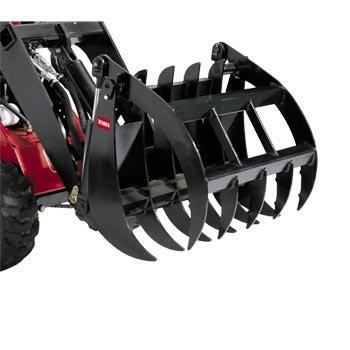 * Please call us for any questions on our grapple rake dingo rentals in Cincinnati Ohio.